Alluring and charming, our collection of womens diamond necklaces sparkles with the highest quality of white & fancy color genuine brilliants! 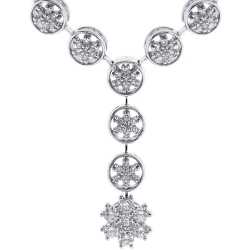 Most of the presented jewels are designed in 18k and 14k white gold. We carry different styles and designs such as tennis, graduated, by the yard, heart, flower, antique style diamond necklaces and other gorgeous variations! Our bling selection of mens diamond chains is sparkling with high quality diamonds in many colors! From white, yellow, blue, green to brown and black stones... we have iced out diamond franco, rosary, bezel set, bullet chains, cuban link, bead ball chains available in many precious metals and color variations. Each piece is exclusively handcrafted by highly skilled jewelers to make a real state of art piece! 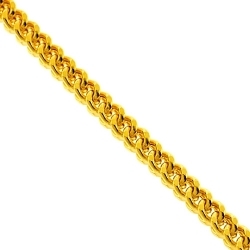 For conservative types, we offer plain gold or silver designs like rope, plain or diamond cut franco, mesh, wheat, byzantine, miami cuban link, bead ball, figaro, mariner, rosary chains and other popular types! With our selection and competitive prices, be sure to find your favorite one! Men's chain is one of those things that never goes out of style and getting more and more demanding piece of jewelry from season to season! 24diamonds.com carries the largest inventory of necklaces for men available in different styles, designs, sizes and prices in gold as well as silver. From classic designs to modern link styles, every piece of jewelry adds a handsome touch to your everyday look. There is no other place where you can find so many popular and custom made link chains including miami cuban, box, rope, figaro, franco, mariner, byzantine, cable, wheat, moon-cut ball, tiger eye, rosary and much more. All presented jewelry pieces are created from the highest quality materials such as gold of 10k-24k purity, sterling silver and stainless steel. Our specialization is men's gold chains and silver chains produced in Italy as well as miami cuban links handmade in USA. We are sure you will enjoy wearing one of those necklaces available in plenty of length and thickness sizes and enjoy a great packaging included with the purchase! Women's necklace is one of those fancy accessories that ideally matches any look and personality! It is definitely a reflection of your taste, style and even mood. Our online store offers a spectacular selection of chains for ladies varying from unique styles, designs, sizes, materials used and prices. From affordable classic link chains to rich royal-looking gemstone necklaces, each of these jewels would add a special detail to your wardrobe. There is no other store where you can discover amazing assortment of link designs including herringbone, rope, singapore, box, bismark, valentine, tennis, lariat and some others. All featured items are high quality made by experienced jewelers and each item is stamped with its own metal purity mark such as 925 sterling silver, 10k-18K gold or 950 platinum. Whether you are looking for a little gift or luxurious one of a kind necklace for a special occasion, 24diamonds.com is the right place to make your purchase! Gold chains are timeless and most popular accessory among men and women that always keep its value and never go out of fashion! 24diamonds.com offers the largest online selection of real gold chains with various designs, styles, sizes and prices. The solid gold necklace you choose to wear can change your look dramatically, - whether it is an elegant necklace or a bold durable chain, our highest quality polished finish will make you shine all day and night! We guarantee that all presented chains are produced from real gold. Choose from the most popular and affordable 10 karat or 14 karat of yellow, white and rose colors. Or take a look at our luxurious line of 18 karat or 24 karat gold necklaces. To satisfy every sophisticated person, we have lots of different styles available: miami cuban link, franco, rope, box, flat cuban, byzantine, army bead, figaro, cable, herringbone, religious rosary, etc. Most of these styles can be worn on its own, layered with other necklaces or paired with a favorite pendant. So, it's up to you now to choose your perfect real gold chain! 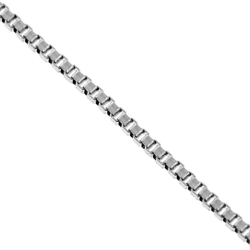 Stainless steel chain is a good alternative to silver or gold chain if you are limited on budget and looking for a durable chain that will last for a long time. Have you been dreaming about expensive yellow or rose gold necklace that you have seen on many celebrities? Most of designs available are covered with a special long-lasting gold or black pvd plating that perfectly imitates pricey gold and black chains. Here you may find such popular styles as rosary, franco, omega, snake, bicycle and others. The chains feature various width, length and weight, so whatever you need a light one or oversized necklace to show off with your heavy pendant, we have them all. Find your stainless steel chain today and save some money because all our items below are highly discounted! Get a stylish look wearing one of those pieces of jewelry! Flat cuban link chains consist of small oval links connected together. Unlike figaro link chains, these curb chains are all the same size and perfectly match with each other. Micro cuban chains are a classic style, and are what most people picture when they think of men's gold chains. 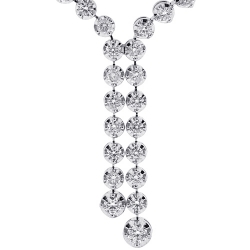 Because they are so classic, these concave chains come in many different sizes and styles, including those that made diamonds embedded in some of the individual links. Another great plus of this type of chain is that because of the design specifics, the actual necklace looks wider and larger than regular miami cuban links. They are commonly available in 10k or 14k gold and different gold color variations: white gold, yellow gold and rose gold. Whether your style is classic or contemporary, there is a type of gold chain available for you. It all depends on what style chain, as well as what type of gold that you are looking for. We are offering the largest selection of italian flat cuban links chains for almost any budget, please check our selection today and pick your favorite one! Byzantine chains are named after their place of origin which is Byzantine Empire. That period of time took place approximately in the year 330 a.d. Byzantine necklaces feature an intricate appearance and great flexibility! Consisting of links that are looped in and through each other to form an unusual pattern that resembles a rope; technically, four loops pass through one single loop and this keeps on repeating over and over throughout the entire length of the chain, resulting in a stunning chain that can be worn anytime and anywhere, with any formal and informal outfit. 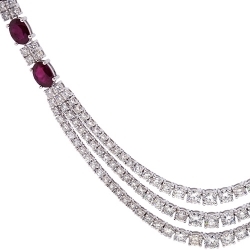 At 24diamonds.com we carry classic byzantine necklaces of various length and thickness that can be perfect for both men and women. Different metals are also available. You may choose from real 10k or 14k gold of white, yellow or rose colors as well as Italian 925 sterling silver. This unique design exhibits both elegance and strength. And it will definitely become your powerful statement piece of jewelry! Another popular design of chains is franco, well-known for its durability, versatility and the unique appearance! Seen on many American celebrities, these necklaces are often featured in many magazines, disk covers and music videos. The design features interweaved V-shaped links that make it sturdy enough to pair with heavy-weight pendants. All franco chains are made in Italy because complicated manufacturing process requires particular special skills and professionalism of the highest level. Here you can find franco necklaces created from 10k and 14k gold, sterling silver or stainless steel. We offer the largest selection of sizes: thickness ranges from 0.5 to 10 mm, and length runs from 16 to 40 inches. If you are looking for one of a kind franco chain, we are glad to offer fully iced out chains, with top quality genuine white or black diamonds. 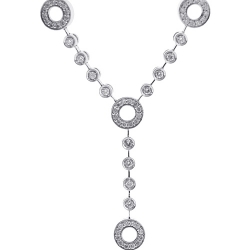 You are certain to find a perfect franco link chain per your style and budget to show off your sophisticated taste! Herringbone chains are flat and made of many small links connected together. This specific design of gold herringbone necklace gets its funny name from the herring fish. These women's gold chains are very flexible and normally lie flat against your skin for a comfortable wear. They have nice smooth look and feel. Became popular in 80s, men' herringbone necklaces are still in fashion and worn by many celebrities: from hip hop stars to the famous athletes all over the world! Its no doubt you saw you these chains before on tv or fashion magazine covers. At 24diamonds.com we have a great selection of womens herringbone chains in different sizes and precious metals: from 10k yellow gold to 925 sterling silver, 2 to 14 mm width, 16 to 24 inches length, so you can choose the right one according your budget as well. 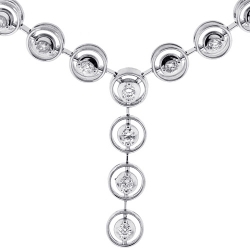 Silver necklaces are expertly handcrafted in Italy and feature a state of art craftsmanship with the affordable price. The best way is to wear these herringbone chains individually, with no pendants to show their alluring beauty and sophistication! Cable chain is one of the most popular and stylish designs today! Looks simple and elegant at the same time, the cable link necklace has been in fashion for a while! 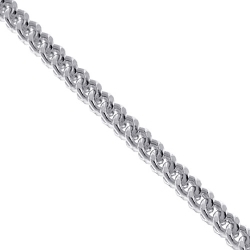 Inspired by the simplicity and durability of the actual cables and professionally reproduced as jewelry creations, this type of chains consist of round or oval links connected with each other in the most traditional and common way. 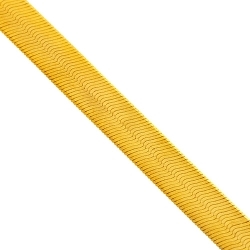 Our company offers cable chains in 10 or 14k white, yellow, rose, two and three tone gold with different links size and length, available in solid and hollow types, whatever you are looking for a massive-looking or more petite design, we have all of them in stock. 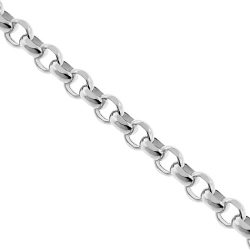 If you are looking for more affordable chains, we are ready to offer the same link type available in 925 sterling silver. Professionally handmade by highly skilled jewelers, these necklaces feature a very smooth finish and detailed state of art craftsmanship! Cable chains are great to wear everyday with any outfit and all season long! Box chain for men and women is one of the most trending styles nowadays! It consists of box-shaped links that joined together. Box chain necklaces are available in different forms - square and rounded, depending on your choice, both are great for everyday wear. 24diamond.com offers a large online collection of these men's box necklaces made of Italian sterling silver or gold of different purity including 10k and 14k. Here you will find lots of sizes - from 0.5 to 5 mm in thickness, and from 16 to 36 inches in length. These women's gold chains are available in white or yellow gold colors to match your personal preference or outfit. Thinner necklaces are ideal for ladies as well as to pair with light-weighted pendants such as petite crosses, keys, stars, hearts, circles of love and other. But if you want to wear it individually, that would work great too - the thick box chains look so handsome, even fastidious person will enjoy the forms and craftsmanship. Enjoy your timeless piece of jewelry! Tiger eye link chain for both men and women is a new way to express the unique style! It features beautifully braided links that depict yin and yang symbol to make a very distinctive look and feel. The necklace can be worn as a protective talisman that is thought to combine the energy of the earth and the sun. These are really rare and hard to find designs that you will not get at a local store. All the jewelry is handmade of real 10k or 14k yellow, rose and white gold or 925 sterling silver in Italy by highly skilled jewelers and we guarantee its exceptional quality. Every piece has a smooth polished finish, very secured lobster claw clasp for a safe wear. These chains are great to wear everyday or for special occasions with any formal or informal outfit. The necklace goes fine with a matching pendant or individually as sell, depending on your preferences. Find your right talisman at 24diamonds.com and save with our heavily discounted prices! Classic rosary necklaces feature a strand of beads with Virgin Mary medallion in the center and crucifix cross on the end. Rosary bead necklace is not only an attractive and fashionable accessory, it also tells people how deep you love Jesus and Mary. Men's rosary necklaces became popular with Catholics in the 16th century when they were embraced by Pope Pius V and are in fashion today. 24diamonds.com offers a variety of rosary cross necklaces made of gold plated, plain or black pvd stainless steel, 925 sterling silver, 10k or 14k gold of white, yellow or rose tones. We have these rosary necklaces available in different styles, designs, sizes and prices. One of a kind rosaries with top quality diamonds are available as well and if you are looking for something exclusive, you are definitely at the right place! Remember that rosary necklace can be both a statement of faith and fashion at the same time, so find your favorite jewelry piece and start wearing it as soon as possible! Your first question can be what wheat link chain is. Well, this is a relatively new style, recently handmade by creative jewelers and becoming more and more popular from day to day! At the same time, this is still a hard to find type of chains, because not much stores offering it due to the limit in production and availability. Featured an enchanting weave designed, it is created from twisted oval links that are connected and intertwined together. This design is also called Spiga. It is a perfect piece to wear alone or paired with a favorite religious or other type charm. All the chains are made of real Italian 10k or 14k gold of different colors including yellow, rose and white. 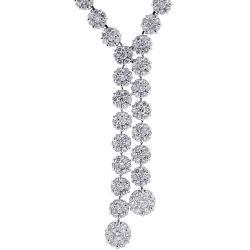 At 24diamonds.com you will be able to find a wheat necklace of desired length and thickness. This style adds some extra elegance and class to your everyday look! It could be worn with any outfit and would be a precious addition to your jewelry collection. The highest quality is guaranteed as well as free and fast domestic shipping. 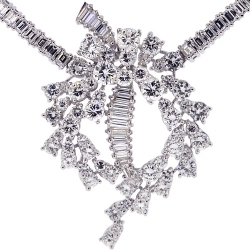 If you are looking for the perfect piece of jewelry for your next special event then a diamond lariat necklace may be an amazing choice! 24diamonds.com offers a rich variety of Y shape and lariat statement necklaces for any sophisticated taste! Our Y-shaped and lariat chains are skillfully handmade of different materials including 10k, 14k, 18k yellow, rose and white gold as well as platinum and 925 sterling silver. They're masterly encrusted with natural diamonds, blue and pink sapphires, red rubies, green emeralds, tanzanites, aquamarines and some others natural gemstones. We offer various shapes, length, designs and styles: from vintage inspired, modern and contemporary to recently trending on the red carpet! Our company also specializes in custom made, one-of-a-kind diamond and gemstone necklaces for men and women. Contact us to make you luxurious dreams come true!